NFS – Network File system is used to provide file sharing with in the Unix / Linux environments. kerberized NFS server also used for sharing the directories across the Unix / Linux Platforms. We assume that you already have an kerberos server in place. 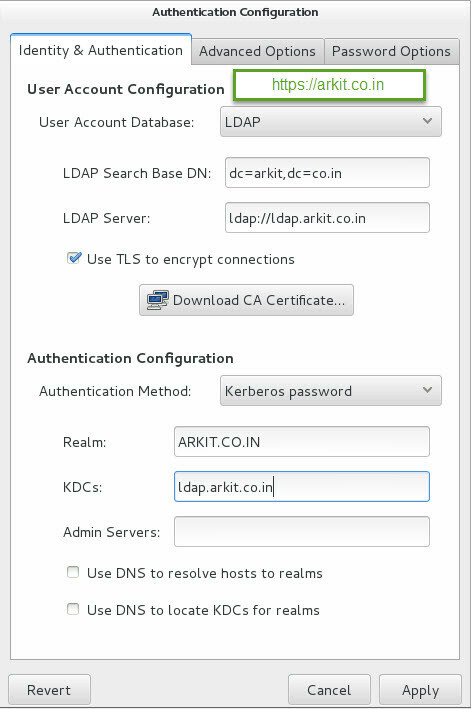 Scenario 1: We can install DNS, Kerberos, KDC server, 365 Directory Service, Token issue authority and LDAP. We use this single server as a main server. Scenario 2: We can install and configure One DNS server, One Kerberos Server and One LDAP Server separately. This Scenario required more hardware resource but performance will be good. why i am explaining above two scenario’s because we are going to see the kerberized NFS with single server all services included in one. We have to generate keytab files and add NFS principles in kerberos server. Authenticating as principal root/admin@ARKIT.CO.IN with password. [root@nfserv.arkit.co.in ~]# semanage fcontext -a -t public_content_rw_t "/nfssecure(/.*)?" Now login as ldapuser1 and try to access the nfssecure share it will be accessible. You can also write data to that share path. kerberized NFS server is highly secured and encrypted communication. NFS kerberized share can’t be accessible by other users who does not have permission to NFS share within the same client.